Yesterday evening(August 12th) the 2018 Teen Choice Awards took place at The Forum in Inglewood, CA. 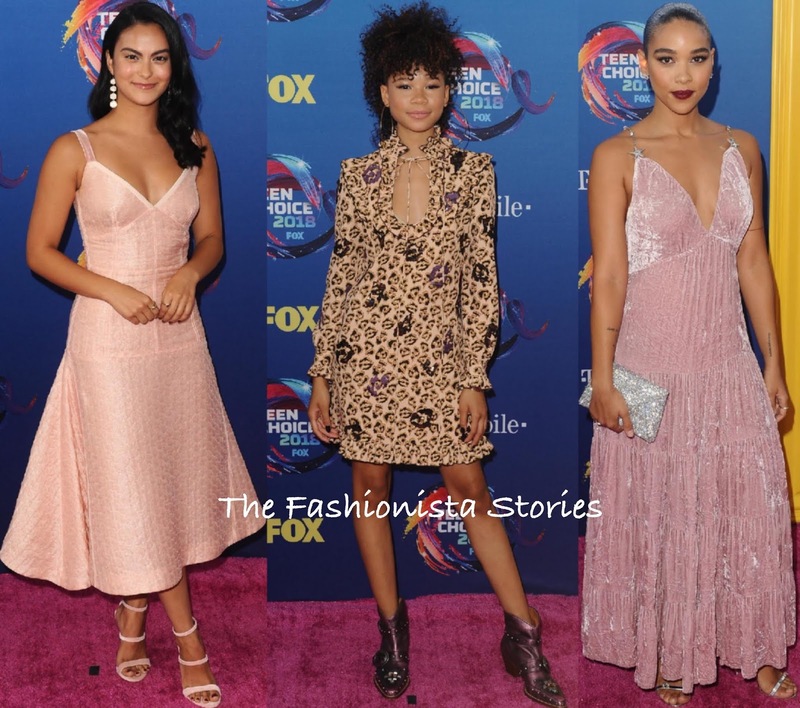 To see all of the pink carpet looks, click HERE and continue below for the wrap-up. 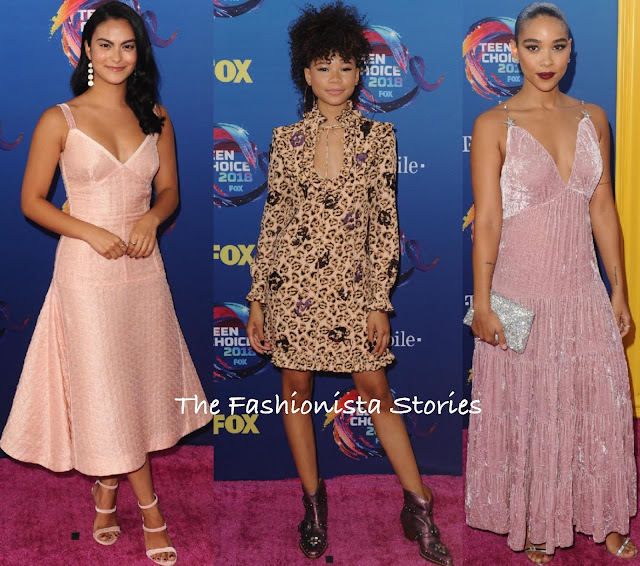 Camila Mendes looked lovely as always wearing a pink FENDI SPRING 2018 sheer organza strap, v-neck dress which she accessorized with JACQUIE AICHE earrings, KAT KIM rings and SOPHIA WEBSTER sandals. Storm Reid was one of my favorites rocking a COACH head to toe. Love her curly mohawk but I definitely would have left the over-sized gold hoops our as they were not needed. Alexandra Shipp looked great in a MIU MIU pink velvet dress, featuring embellished star straps. It maybe too warm for the fabric but she still looked great. Also the dark red lip was perfect with her pink dress. Nina Dobrev wore a CALVIN KLEIN 205W39NYC PRE-FALL 2018 long sleeve leather plonge uniform shirt dress which she accessorized with a silver metallic clutch & sandals. A red lip and side parted waves finished up her great look. Lili Reinhart sparkled in a MONIQUE LHUILLIER FALL 2018 strapless fuchsia sequin dress which stopped just above her ankles and featured a tie waist. If there is ever a time I wanted to see a black pump, it is now. I am not sure why she chose these pink pumps as they do not work with her look at all. Anna Kendrick who hilariously accepted her award, wore a DAVID KOMA RESORT 2019 pink crepe & silver sequin panel mini dress which she teamed with GIUSEPPE ZANOTTI heels. Chandler Kinney also looked great in a GRETEL Z FALL 2017 sleeveless two-tone shift dress which featured a white yoke and a black dress which was adorned with white tulle flowers & black feathers. Pops of color came via her fuchsia LORIBLU clutch and slingback pumps. LILOU jewelry and a high ponytail topped off her look. Bebe Rexha was on hand as a performed. She wore a bubble gum pink LA ROXX latex suit with a AUGUST GETTY crystal bra underneath. NORMAN SILVERMAN jewelry and PRADA sandals finished up her look. Maia Mitchell wore a MARIO DICE FALL 2018 black long sleeve cocktail dress featuring a contrasting white collar & fishnet bib and ruffle pleated skirt. A BY KILIAN clutch, LILOU jewelry and LORIBLU heels finished up her great look. Normani took over the pink carpet wearing a TOMMY HILFIGER shimmery bandeau and a red & black check print voluminous skirt with a logo waistband. GIUSEPPE ZANOTTI sandals and long ponytail finished up her look.